We are just fans, all © belong to the original owners! Shouya Ishida wakes up one day, he is tired of his life, for many years now, he has had a burden in his heart, and finally, he wants to find peace. 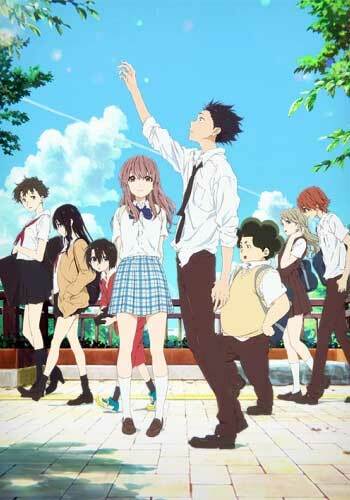 He makes a bold step looking for Shouko Nishimiya, an old classmate from his elementary school days. Back then, Shouya was not nice to her, he made fun of her and even hurt her physically. For him, life was complicated, but he was fortunate enough to have a caring mother to look after him. However, when Shouko transferred to his class, kids had no opportunity, nor knowledge, to interact with Shouko, after all, she is deaf. She tried her best, and even in the worst moments, she tried to share a smile with everyone. However, for the kids in her class, like Naoka Ueno, this was troublesome, and annoying. Naoka did not hesitate to mock Shouko, but somehow, first she tried to help her. Unfortunately, at that age, social pressure made kids become rude against Shouko, and anyone trying to help her. As a result, Shouya does everything to corner Shouko, he disrespects her, hurts her constantly and harass her without hesitation. He seems to hate her. Finally, Shouko’s mother reacts, forcing Shouya’s mother to face the truth. His son has done something terrible and they will have to pay back. After and awful attack, Shouko trasfers to another school and Shoya is the only one to blame. He ends up betrayed by his so-called friends, who turns out the tables once in junior high, telling everybody to stay away from the bully. The years go by and we find Shouya trying to do something right about Shouko, he learns signal language and without saying a word, tries to make up for the bad moments he made her live. As the movie continues, you find all kind of emotions control the characters, Shouya became a shy person, neglected by those around him. On the other hand, Shouko tries to move on, but is always feeling guilty; she thinks she is a burden to her family, specially her younger sister Yuzuru. Our existence is just a glance of time in the whole universe; we are meant to fulfill it searching for happiness, and sharing it with those, we call friends. Please do not waste it! A manga series written and illustrated by Yoshitoki Ooima. The series was originally published as a one-shot in the February 2011 issue of Bessatsu Shounen Magazine and later began a full serialization in Weekly Shounen Magazine in August 2013, it ended on November 19, 2014. An anime theatrical film adaptation produced by Kyoto Animation was released on September 17, 2016.